France, the Netherlands and Canada make up the top three. 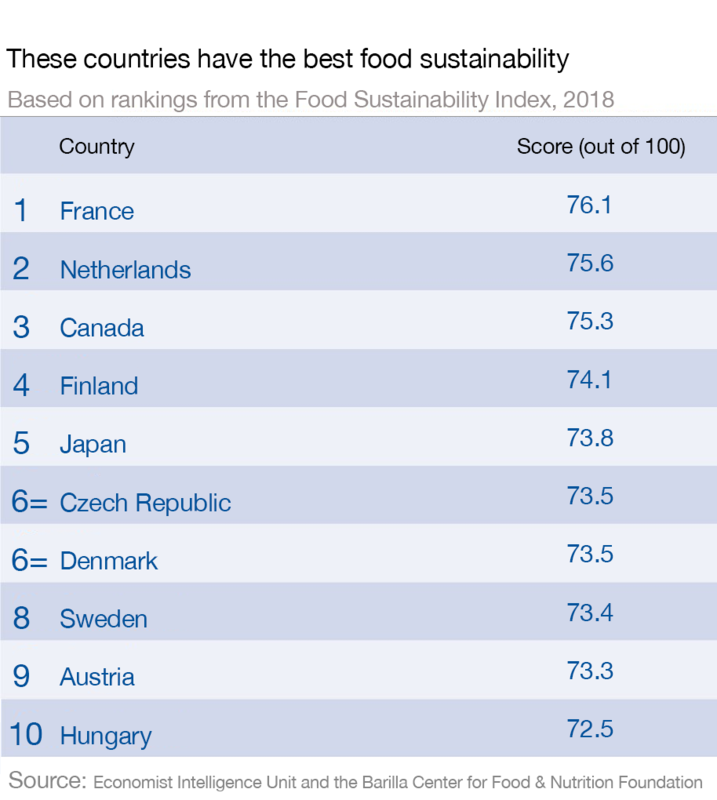 France's aggressive measures to tackle food waste, promote healthy lifestyles and adopt eco-farming techniques helped it top a ranking of nations, published on Tuesday, which assesses their food sustainability. "France has been in the vanguard of policies and measures to reduce such losses," said Martin Koehring, the index's author. France is also pressing ahead with an agroecology policy, which its agriculture ministry says "aims to shift agriculture towards the objective of combining economic, environmental and social performance." How can we provide sustainable food to everyone? France is showing that "improvements in agricultural performance should not come at the expense of environmental and social conditions," he told the Thomson Reuters Foundation.